DESCRIPTION: Wing length 4.5 - 8mm. 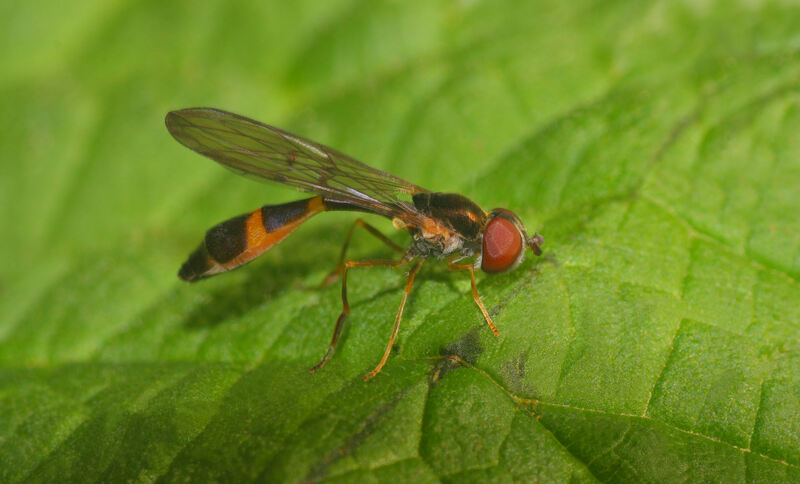 An unobstrusive little hoverfly that is best recognised by its slender appearance and long narrow-waisted abdomen. This abdomen is black in colour with a yellow spot on the 3rd and 4th tergite. The legs are brownish yellow and the forehead is brightly hairy. The wings are clear or may have very faint brownish markings. BEHAVIOUR: Adults are low-flying creatures that can easily be overlooked due to their small size. The larvae are predatory and feed on a variety of aphids. This species overwinters as a larva. DISTRIBUTION: Widespread throughout Britain but never found in large numbers. HABITAT: Coniferous and deciduous forests, woodland, hedgerows, scrub and gardens. They have a preference for shady places low to the ground around lush herbage. PERIOD: March to October with the main peak from May to July.